SensiCare Silk nitrile exam gloves have a soft and comfortable feel. Stretches the closest to latex. Dark blue color with textured fingertips for better grip. AllegroMedical.com presents The SensiCare Silk Nitrile Exam Gloves. 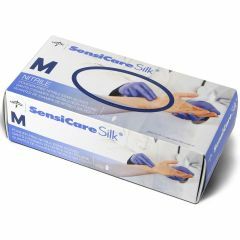 SensiCare Silk nitrile exam gloves have a soft and comfortable feel. Stretches the closest to latex. Outstanding tactile sensitivity. Dark blue color with textured fingertips for better grip. Not made with natural rubber latex. Tested for use with chemotherapy drugs.